And our very own international singing sensation–Charice–is at no. 38! Topping the list, of course (hands down), is young superstar Justin Bieber who recently won Choice Male Artist, Choice Breakout Artist Male and Choice Summer Music Star in the recently concluded Teen Choice Awards. Second in their list is the star of Twilight Taylor Lautner who outshone his co-star Robert Pattinson at the Teen Choice Awards. Pattinson is at no. 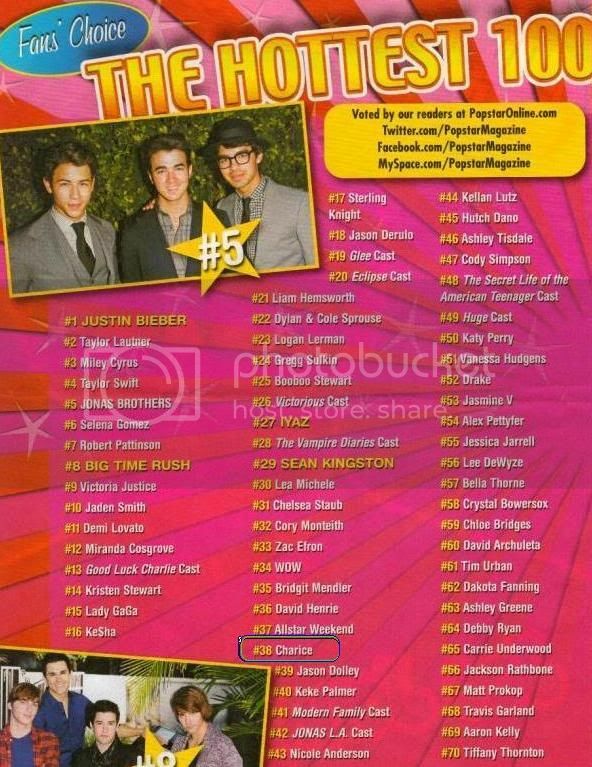 7 in the Popstar list. Multimedia artists occupied the 3rd to 6th slot namely Miley Cyrus, Taylor Swift, The Jonas Brothers and Selena Gomez. These four have movies and tv shows of their own aside from being successful recording artists. I’m not sure though why the cast of Good Luck Charlie (#13) ranked higher than the Glee cast (#19). It’s because there’s no Glee the whole summer perhaps? Charice is at no. 38. She outranked High School Musical’s Ashley Tisdale (#46) and Vanessa Hudgens (#51). She also ranked higher than Katy Perry (#50), the reigning American Idol Lee Dewyze (#56) and her friend David Archuleta (#60). wow charice. im sure tataas at sisikat pa sya paglabas ng glee and a new single na wala sa album nia.. go go go..